The Bunnyman got up, dusted himself off and hopped up to Skratch. It was Major Spitlove the double agent. He looked nervous but Skratch chortled. "Do you think they bought it?" Spitlove shrugged and looked up at their gang on the bridge. "Looks like it." He lifted the pumpkin head. "My robotic friend Jack sent me a live video feed for the whole affair." "Can I have a copy?" snickered Skratch. Some way off on the bridge - and out of earshot - the Wabbit smiled and nudged Wabsworth. "Do you think they fell for it?" "Looks like it," giggled Wabsworth. He nodded vigorously. "That radio axe was a great idea." The Wabbit relaxed. "We can have our party now." They made their way down the clangy iron stairs. Skratch was still smiling. He gave Spitlove a hug. "Now our trick is over it's time for our party." Lapinette called down from the bridge and her voice was frantic. "Look out! Look out for the Hand!" The Wabbit merely grinned. "What trickery is this?! An axe struck the pumpkin squarely above the eyes. It squeaked and bled viciously. "Aaaagh!" shouted Spitlove. He dropped the pumpkin and kicked it. It flew in the air. The Wabbit dived forward to catch it, but squashed it flat. "Yuk, it's all over my fur," groaned the Wabbit. "The Wabbit fell for it!" laughed Lapinette. Jenny rocked back on her boots and tilted her pirate hat. "That be a hat trick." Skratch was fast but the Bunnyman was faster. Skratch arrived at the Hallowe'en venue with his pursuer right behind him. The Bunnyman stood at the top of the stairs, swinging his axe from side to side as he recited a list of his 500 victims. Skratch prepared for combat but the list was so long, he began to feel numbed. The Bunnyman lurched down the stairway and with each step he let his axe drop on the metal treads. Hideous clangs rang out across Pluto Park. 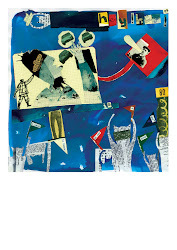 Peering out the corner of one eye, Skratch saw vague movement on the bridge. He hoped it was the Wabbit, so he stayed silent and tried to distract the Bunnyman. He yelled out. "That's a load of piffle! The Bunnyman is all discredited now." Sparks flew as the Bunnyman's axe hit the rails. "I'll chop off your cat head and stick it on a spike!" A silence followed. Someone shouted from the shadows. "Drop the weapon and put your paws on the rail." "More victims," snickered the Bunnyman. He lifted the axe and threw it. Skratch leaped out the way. A shot rang out, followed by another. The axe shaft splintered. The Bunnyman looked at his chest, then sagged and keeled over. With one leg caught in the stairs, he was trapped. His breath was shallow now. "I'll be back," he muttered. It was his last gasp as he slumped and lay prone. Skratch shouted to the Wabbit, "Please tell me this is a prank." 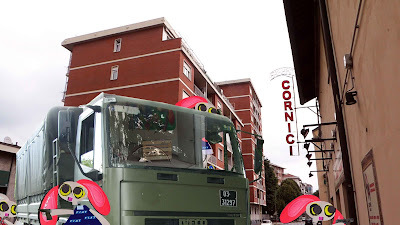 The Wabbit blew smoke from the barrel of his automatic. Moonlight glinted from his 28 teeth. "Just a lark in the park." Unaware of the search for the severed head, Skratch arrived to scout the usual Hallowe'en location. This year he had a Bunnyman surprise up his sleeve and he wanted to set the scene. Dusk fell on Pluto Park. The sky darkened as he made his way along the wall that skirted the old abandoned power station. The graffito lady looked startled as she always did - but tonight she seemed more startled than usual. He thought he heard a noise behind him and he turned. There was nothing - just a wolf moon making its way across the evening sky. "Skratch beware!" said a voice. Skratch looked the mural up and down. "Beware what?" he murmured. "Beware the Bunnyman." It was a whisper, barely audible, and it oozed from bricks and mortar to rustle the dark grass behind him. Skratch turned again. Nothing. His fur shivered. "The Bunnyman is an urban myth," he said to himself. "Legend," said the wall. Skratch shrugged but his shrug was dutiful. The wall spoke again. 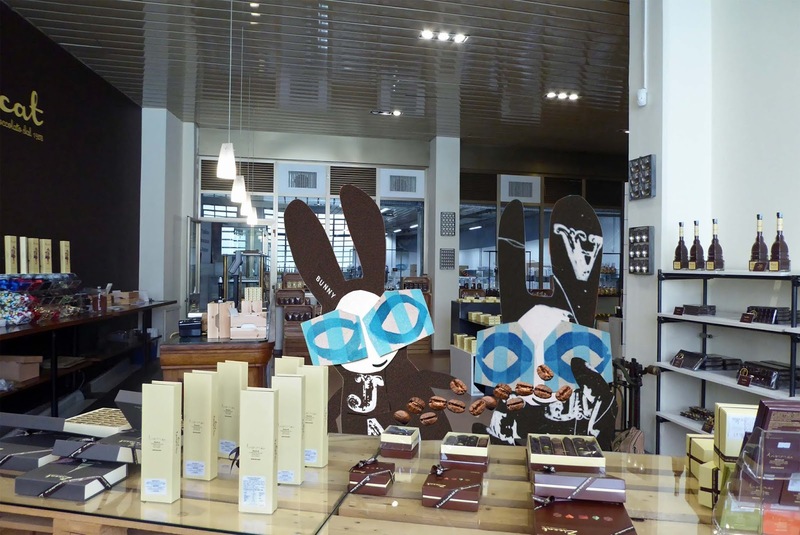 "By the crumbling of my bricks and mortar, the Bunnyman aims to make you shorter." Now Skratch's ears made out the steady march of footsteps. In the moonlight he glimpsed a flicker of a shadow shape drawing closer. He relaxed his muscles, then tensed. Just when the shape poised over his head, he sprang in the air. An axe sliced the wall where his head had been. Shards of mortar showered the grass. Skratch leaped atop the wall and raced along it like the fastest cheetah there ever was. "I wasn't planning on a run," puffed Skratch. The search for the severed head began in earnest. Duetta's red spiders crawled the towers, while Lapinette climbed onto a ledge and eagle-eyed the area. The Wabbit thought of the words of a favourite detective. “It is the brain, the little gray cells on which one must rely," he said to himself. He settled back and had a think. He shut his eyes. "One must seek the truth within, not without," said a ghostly voice. 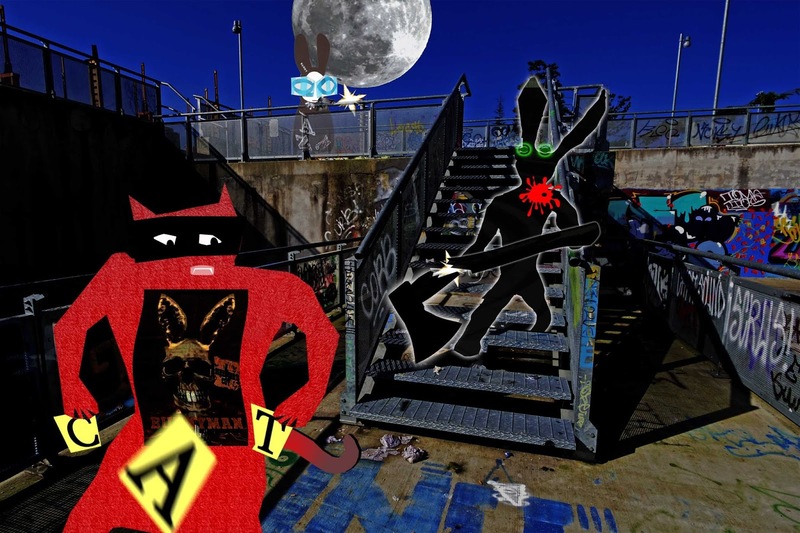 "Quite right," thought the Wabbit. An unearthly shove woke him up. "Ghost Bunny!" he yelled. "Sleuth Bunny's my name!" said Ghost Bunny. 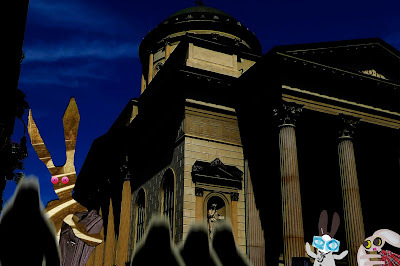 The Wabbit adopted a spooky voice. "Haunting's your game?" 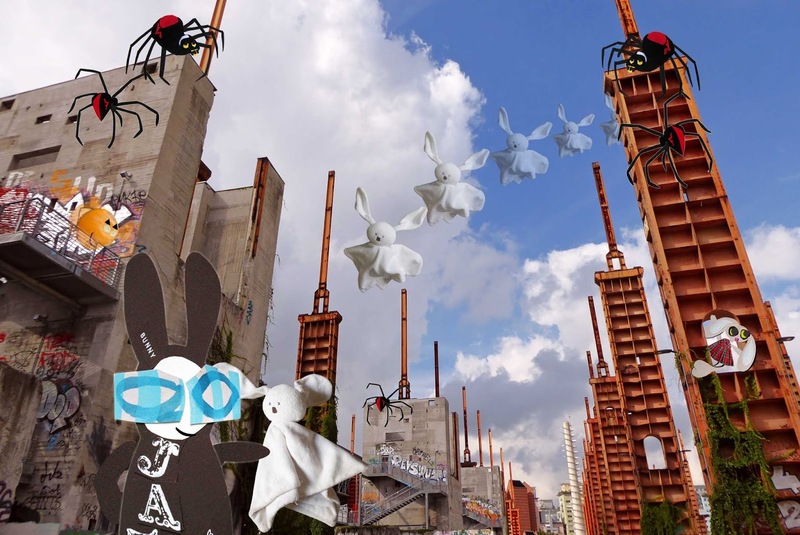 Ghost Bunny fluttered and swooped. "I'm here to paranormally assist." 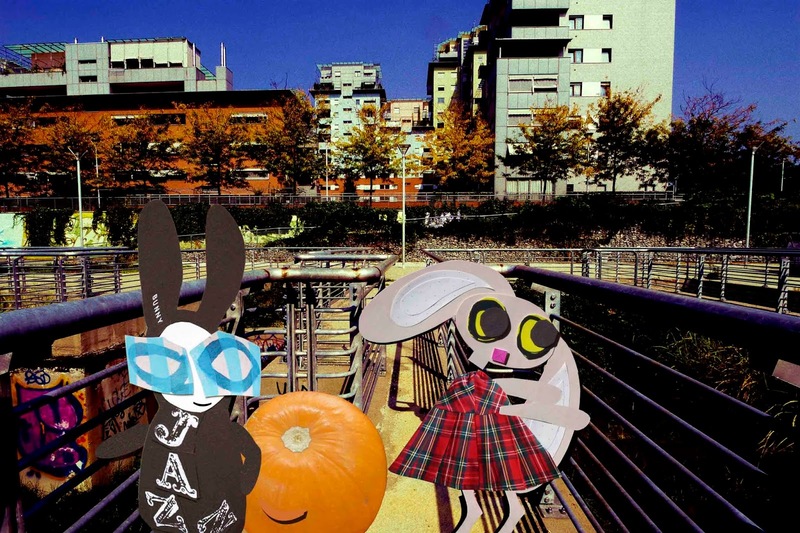 The Wabbit pointed to the giant pumpkin. 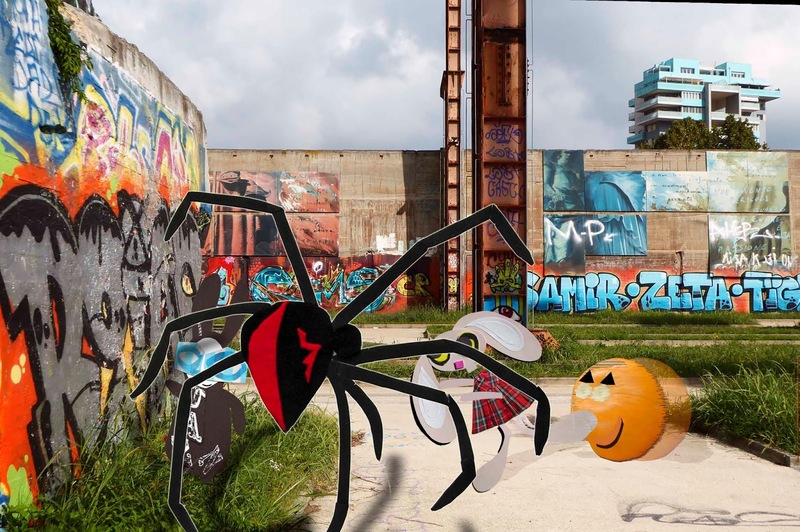 The pumpkin was wary of the spiders and had camouflaged itself against graffiti. It stared down from a balcony. He made a face at the pumpkin. The pumpkin made a face back. "Can you get rid of that pesky pumpkin?" groaned the Wabbit. "I'm a ghost, not a bouncer," shrieked Ghost Bunny. Without warning, she shot in the air and fluttered down. "I'm concentrating. I'm picking up vibrations." She let out a terrifying yell. "I see an axe. He did it with an axe." "Who did?" asked the Wabbit. "The Bunnyman!" screamed Ghost Bunny, "I can see the axe rising and falling." "Can you see the victim's head?" asked the Wabbit. "I can see something rolling into the distance," screeched Ghost Bunny. The Wabbit waited. "I hear it shouting," moaned Ghost Bunny, "shouting its head off." The Wabbit and Lapinette decided to hunt for the missing head - but whichever way they headed the giant pumpkin followed. No matter how hard they discouraged it, it stuck to them like glue. "It only wants attention," scowled the Wabbit. Lapinette tapped it with her foot. It squelched backwards and then returned to where it was. The Wabbit snorted and turned to examine graffiti. "Perhaps the perpetrator left a secret message." "Why would he do that?" asked Lapinette. "It's the sort of thing they're known for," shrugged the Wabbit. A shadow fell across his face and he looked up to see Marshall Duetta Spyder. "Can I help, Commander?" "Duetta!" laughed the Wabbit, "We're looking for a head. Any ideas?" Marshall Duetta rattled her legs. "Who's head?" "If only we had the head," sighed the Wabbit, "then we might know who it was." Marshall Duetta hissed and rattled. "Headless corpse eh? Clearly the modus operandi of the Bunnyman." The Wabbit clapped his paws and pointed at Lapinette. "I told you so!" Lapinette jumped up and down and yelled, "It's an urban myth!" Duetta's laughter made the grass ripple. It was then that Lapinette felt a nudge from the giant pumpkin. She kicked it away, then bent to look closely. "Wabbit, did the pumpkin have a face?" 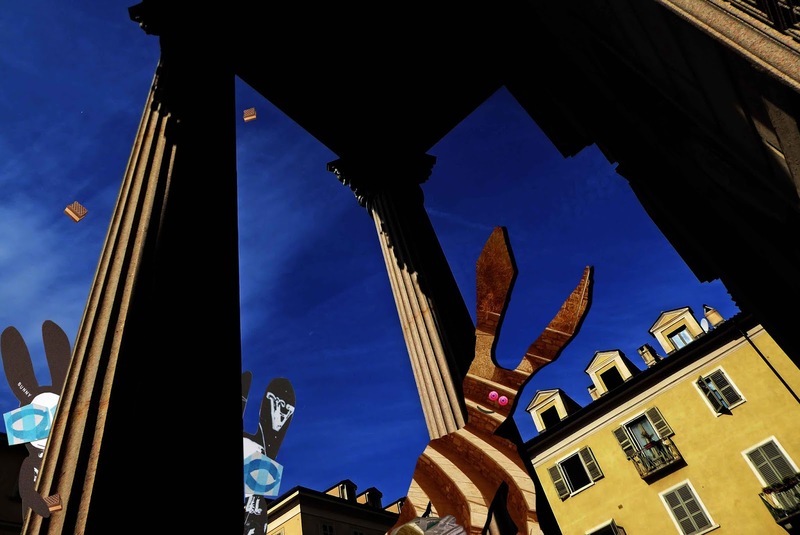 The Wabbit's eyes gleamed. "Maybe it's a clue." "Maybe it's a meal," said Duetta. Lapinette emerged from the designated caffè just in time to see everyone converge. The Wabbit and Skratch were together and they looked excited. The Wabbit saluted cheerfully. Wabsworth followed suit. 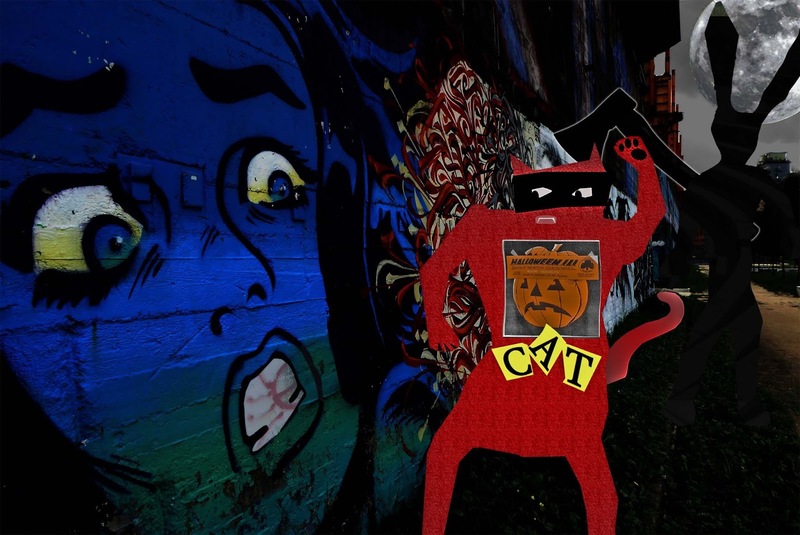 Skratch raised a triumphant paw and yelled, "What was that for a sort of Adventure?" 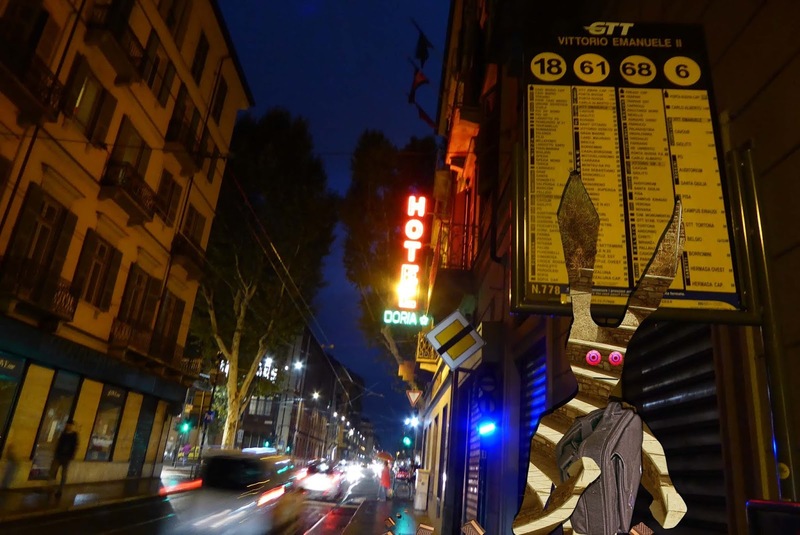 "Let's get the drinks in first," shouted the Wabbit. He grabbed Skratch playfully around the leg. Some diners looked round. "Have some decorum," grinned Lapinette. "Fac me cocleario vomere," said the Wabbit. He took a seat and tried to behave. 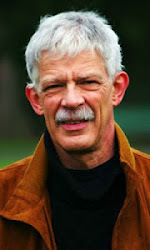 "Comedy is a very serious genre of adventure," remarked Skratch, "It's ultimately the discourse of credible confusion." "Indeed," said Wabsworth, "the Adventure had a singularity which questioned the fragile certitudes of accepted practice." Skratch purred and nodded. "We are all ravaged by the jagged mechanisms of thought." There was a pause in conversation. It was Lapinette's turn to think about the Adventure. "Miracles are mostly conjuring tricks. Jumpback Jack fooled himself." "The essence of comedy," agreed Skratch. "Jack falsely believed himself holy - and others believed his falsification." The Wabbit was getting thirsty. "Hilarious," he said, "shall we conjure up some aperitivi." Lapinette inclined her ears and a waiter emerged. The Wabbit gasped. "How do you do that?" "Magic," said Lapinette. [Fac me cocleario vomere. Spoof Latin. Gag me with a spoon. Jumpback Jack strode from the church clutching his original bag with his original beans. The switch had been easy - and persuading Jack he was holy proved easier. The crowd unfroze and rose as one to meet him. The smell of beans drifted from the bag. "That's the odour of sanctity," gasped a figure. The crowd clustered round Jack. At the church door, the Wabbit spread his paws wide and nodded. Lapinette dug him in the ribs. "Did you put something in with the beans?" "Eau de cologne." smiled the Wabbit. Lapinette snorted. "You've had that perfume at least 15 years." "It won't last long," grinned the Wabbit. Lapinette gave him a look. "Unlike the effect of Batch 10 chocolates." "Hmm. Get it all back?" asked the Wabbit. "Except for the ones they ingested." replied Lapinette. Voices drifted in the morning air. "Let's spread word of the holy beans." "Everyone must know." "We'll go on a pilgrimage." 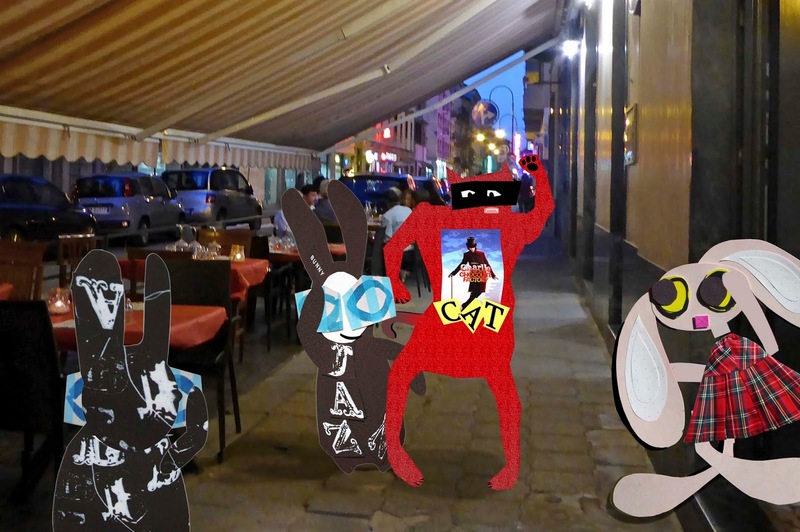 The Wabbit and Lapinette kept their eyes on Jack as the crowd escorted him into the distance. "Absolutely harmless," shrugged the Wabbit. He smiled nervously. "What can possibly go wrong?" He had a bit of a think. "Who was supposed to pick up Batch 10?" "I was," said Lapinette, "but someone had moved it." The Wabbit's mind flashed back to his day at the chocolate factory and he clearly saw himself moving sacks around. He gulped. "Some tidy fellow?" 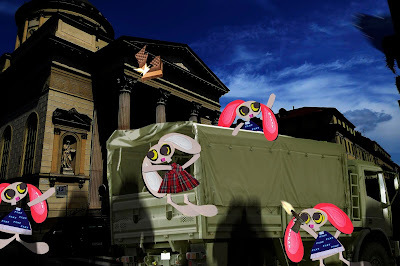 The Wabbit and Wabsworth caught up with Jumpback Jack at the big church on the corner. Jack was heading in and his head was bowed and on his lips was a prayer. "Can you hear him?" asked Wabsworth. The Wabbit flipped his super ears skyward. "I can hear him. Can you hear him?" "He said he was in fear of his enemies" replied Wabsworth, "and he goes to worship in fear." 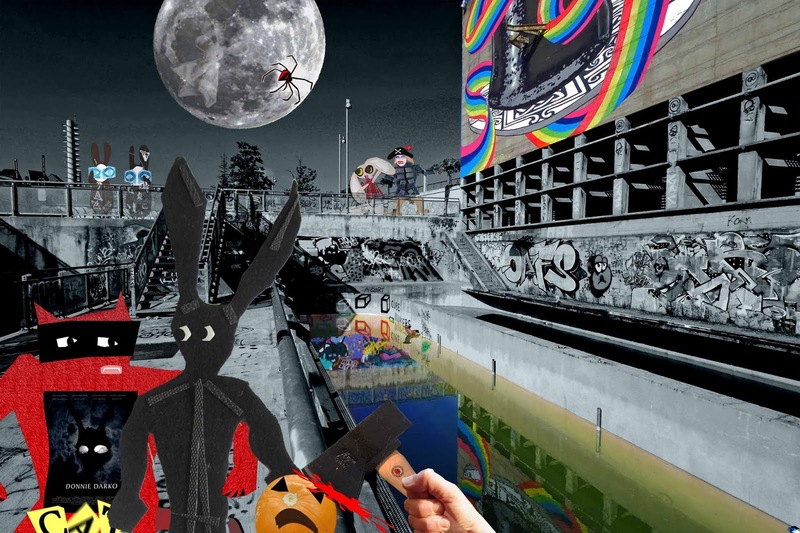 The Wabbit listened carefully. "Fear of the righteous love of Chocolate? Did I get that right?" The Wabbit saw something and he grabbed it. "Chocolate rain," he growled. Wabsworth hissed. "Don't eat it and whatever you do, don't lick your paw." 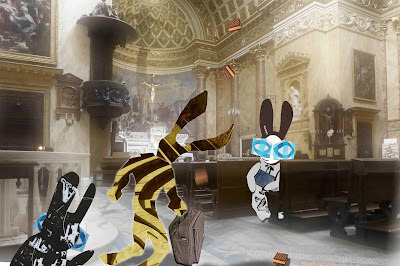 The Wabbit cast it on the entrance and rubbed his paw up and down the pillar, but he had to hide as Jumpback turned. "It's a sign! I will not perish." He dropped the bag and waved his paws in the air. Wabsworth reached out for the bag but Jack stopped waving and knelt beside it. He looked inside and smiled in a sickly manner. "I will share the merits of the blessed." He rose, hugging the bag to his chest. Then he bowed his head and strode into the church. The Wabbit scowled at Wabsworth. "Batch 10? Explain. What do they do?" Wabsworth shrugged just like the Wabbit. "Seized from the Agents of Rabit. It was under analysis." "And?" growled the Wabbit. Wabsworth cast a glance at the open door of the church and pointed to the end of the aisle where Jack knelt before an altar. "It makes you holy."